It finally arrived! 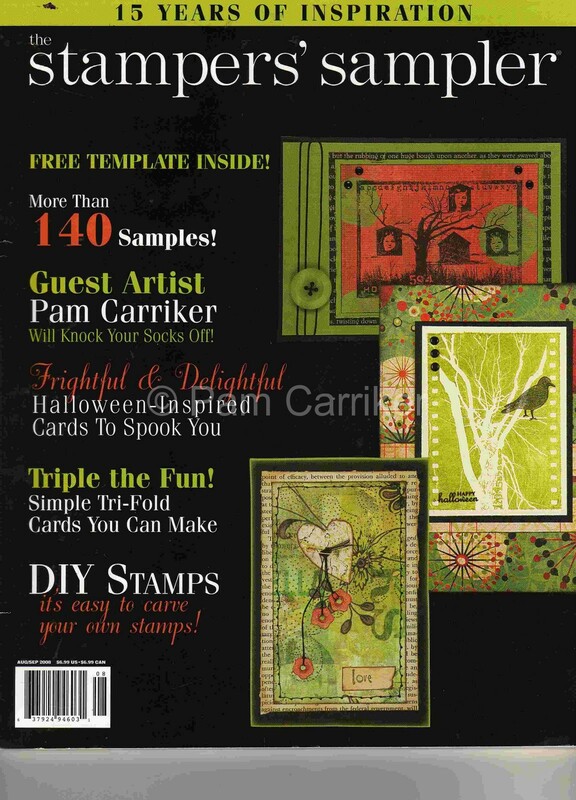 I just received the latest issue of The Stampers’ Sampler and there was my name, on the cover-OMG! I just stood there staring and then ran to show my DH. He looked so proud and said this is the most impressive thing you’ve done yet. Now, why I am blessed with a non-artsy DH, that can be so supportive of my artistic pursuits, I will never know. He puts up with Hobby Lobby and Michael’s receipts coming out his ears, lets me have time to work without feeling guilty, helps me with computer problems, and never fails to tell me he’s proud of me. What more could a girl ask for? Oh, yeah, when I tore the bumper off our brand new GTO a couple of years ago, (looong story) he sent me flowers because he knew how bad I felt about it. Does he get the Best DH of the Year award or what? Seeing the look on his face while he looked through this article, was more than reward enough for the less than glamorous times we all go through. He looked at the first page and said, “Man, they must have used like 25pt font!” LOL! Thank you my blogging friends, old and new, for inspiring me through your comments and your own artistic journey’s. Your support means the world to me. this is wonderful….well, now you know I need to go out and get this magazine…to see more of your article ! !big time congrats…and fun “meeting” you on the Etsy forum last night.may I add your link to my blog? Wow–that is just fantabulous!!! I love the introduction!! I’d be doing cartwheels if I was you!You do have an awesome hubby, the two of you sound perfect together!! Now, does he have a brother?? LOLAgain,congrats on all of your publications and kudos coming your way, you definitely do raise the bar in the stamping and art world!! What well deserved blessings, Pam! I’ll have to pick up that issue! how wonderful! you so deserve all the kudos. your art is just fabulous. i have framed the piece i purchased on etsy “hours passed” and have it graciously hanging in my home. thanks so much! i will definitely check out this article as well. Thanks Blaiz:-) Yes, the feature is 6 pages with an interview on the last page. Only giving a sneak peek here-lol! Wow, congrats! I’m so proud of you! The cover was right, that piece knocked my socks off. 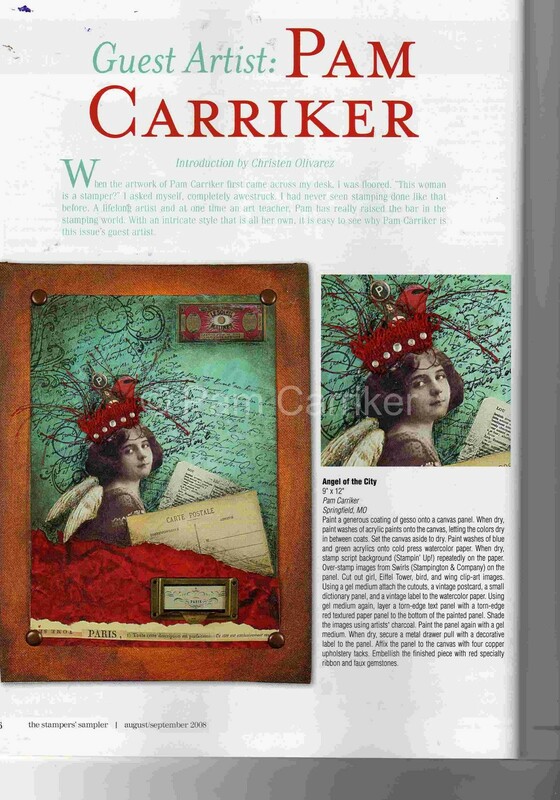 Is there more of your work shown in the issue?